This Italian pasta salad is one of my favorite easy pasta salad recipes. Cold pasta salad recipes are great every day side dishes, but they are perfect for entertaining too. Bring a large pot of well salted water to a boil and add pasta. Cook until al dente and drain. Make the dressing by shaking together in a jar the lemon juice, olive oil, balsamic and red wine vinegars. Chop the green onions and place them in a large serving bowl. Add the olives. Drain the artichoke hearts, cut them into quarters and add them. Slice the red pepper very thinly. Add the pepper slices to the bowl. Add the cooked, drained pasta. Pour the dressing over all and mix well. Add the tomatoes and mix lightly again. Season to taste with salt and pepper. Extra virgin olive oil has a strong and distinctive taste. 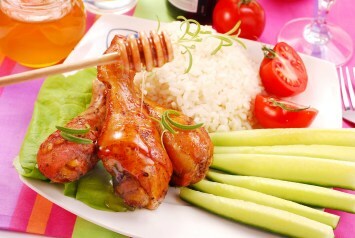 If you prefer use light olive oil or your favorite vegetable oil. As with most recipes, you can change this one up to suit your taste. Add more vegetables – some yellow or orange peppers will add more great color. Vary the look of your salad by using a variety of pasta shapes. I would usually use penne pasta for this recipe, the small tubes, but farfalle pasta (the butterfly shape) or curly fusilli would be a nice visual change. Add a bit of chopped ham if you want meat in your salad. Al dente is Italian for “to the tooth”. It means pasta that is cooked until it is not quite soft all the way through. Al dente cooked pasta will hold its texture with the salad dressing added to it much better that well cooked, mushy pasta. 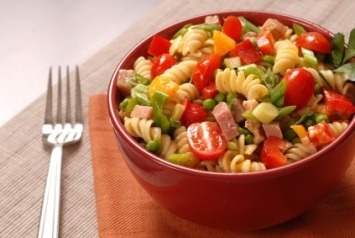 For summer picnics and barbecues a pasta salad with Italian dressing is always welcome. It works well all year round too. Use this salad as an every day side dish or on a buffet table with a mix of other foods. This Italian pasta salad recipe is so easy to prepare, and so delicious you will make it over and over again. Make it even healthier by using whole wheat pasta. If you like this Italian pasta salad, you will find a large selection of salad recipes for every occasion here.